Beolink 1000 was Bang & Olufsen's entry remote control terminal, released in 1986. Its bigger brothers were the two-way Beolink 5000 and Beolink 7000 terminals. It originally came in a number of guises: released in 1987 was Terminal A, followed by Terminal V and then Terminal AV. 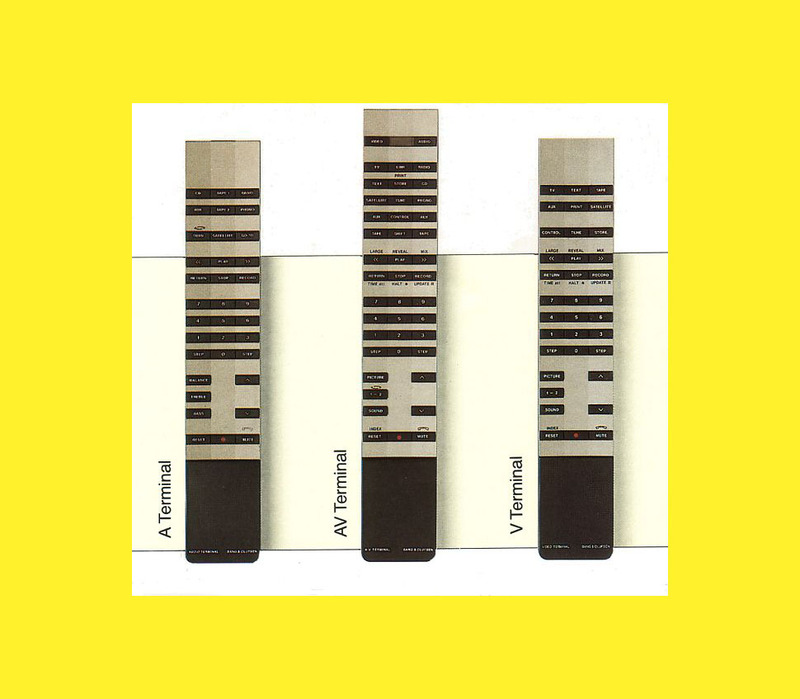 Their purpose was to control the audio section of various hi-fis (Terminal A); the video sections (Terminal V) and combined functions (Terminal AV). Beolink 1000 won the ID Award in 1986. Beomaster 2400’s new element was the Commander - the remote control - which no High-Fidelity producer had even dreamed of making before. In America, however, remote- controlled TVs had already become a reality and in Europe, the first TV commanders, with a plethora of buttons, had turned up in Germany. Bang & Olufsen’s idea was not to supply remote controls for its systems, it was to provide the user with easier operation - to put the entire selection of sound and picture in users’ hands. Although today, this is perhaps self-evident, this was not the case at the time. Nobody had so far dared to pursue such an obvious concept. It did not take long for the idea to take root. Soon afterwards, all Bang & Olufsen’s systems enabled the user to operate the system from a commander. The Bang & Olufsen Idea Group insisted that users should be able to operate the commander with one finger on one hand, the thumb. This was vastly different from the commanders manufactured by other producers where the many buttons meant that the user had to hold the commander in one hand, the manual in another while the index finger of the third hand pressed the button selected by the eye. The concept was dubbed 'the feel commander'. This meant that the TV could be operated by the thumb on one hand – almost as if the user was feeling his way through a new type of Braille, allowing the eye to concentrate on the essential, the picture. The culmination of the development of the idea of a 'total commander’ came in 1985 when David Lewis designed a Beolink terminal where the user, without using his eyes, could control picture, sound and light by applying a slight pressure of the thumb. Incredibly, it could be used in all the rooms of a house. This later system, known as Beolink®, eventually incorporated most of Bang & Olufsen's audio and video products. The Beolink 1000 family of remote controls is made up of four unique products; all similar in appearance, but each was brought out at a different time, for a variety of differing functions. First there was the Audio Terminal (or 'A Terminal'). This was then followed by both the 'Video Terminal' (used by Beovisions LX2800 and LX2500) and then the 'AV terminal'. Lastly was the Beolink 1000 as we recognise it today. Both of these latter Terminals are shown above. The Audio and Video Terminals are similar in appearance to each other. However, they both accommodate different sets of buttons. With both these controls the bottom plate is stamped to differentiate them as either an Audio or Video Terminal. Size-wise, both Terminals are around 1,5cm shorter than a (current) Beolink 1000 Terminal. Beolink 1000 Mk III was the last model produced and does not include a 'turn' button. To turn over the tape of your Beocord cassette deck, press SHIFT + SOUND. In order to access 'Balance' press SOUND twice and then use the volume up and down to adjust. To alter 'Treble', press SOUND three times and adjust in the same manner; for 'Bass' press SOUND four times. To save your new settings, press SOUND and then STORE. In comparison, the AV terminal is about 1cm longer than a Beolink 1000. The AV terminal could operate both audio and video and again was released before Beolink 1000. All three Terminals were black and dark grey coloured. Since its introduction in 1986, the Beolink 1000 family of remote controls has been able to control all subsequent Bang & Olufsen products - both audio and video. Beo4 is a direct descendant of these remote controls, together with its (former) smaller brother, Beo1. Most infra-red remote controls work on a 40KHz carrier. Only Bang & Olufsen and a handful of Sony and Kenwood products use 455KHz as the carrier frequency. This more powerful frequency allows the Terminals to command products from a greater distance and often, it is not a requirement to 'fire' them directly at the items' sensors.